‘Decision Points’ is flying off the shelves. George W. Bush sold over 2 million copies in one month – as many as Bill Clinton sold in 6 years. It may be a monstrous success but that doesn’t mean the state-run media will like it. 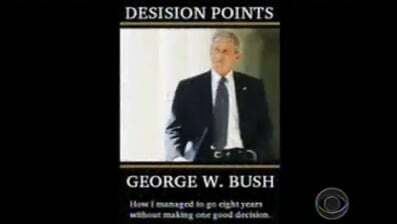 In ‘Decision Points,’ Mr Bush recounts the inner workings of the White House and his administration following the September 11 attacks, including decisions that led to the wars in Afghanistan in Iraq. He recounts parts of his childhood, speaks lovingly of his family and wife, and wonders about how history will judge him.